The Comfort365 automatically controls heating, cooling and AIRFLOW in two-story homes and provides upstairs and downstairs comfort in all seasons without a zoning panel. The Comfort365 is also used in one-story homes to provide uniform comfort in the living and sleeping areas. 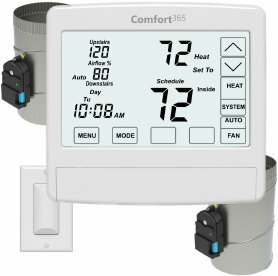 The C365 thermostat monitors the downstairs and upstairs temperatures and every 2 minutes, during a heating and cooling calls, compares the thermostat and the sensor temperatures and automatically adjusts the modulating dampers 2% so that more airflow is directed to the area that needs it for a uniformly comfortable home. subbase and only one WiFi thermostat required compared to two for zoning. Wired solution for Residential New Construction and Wireless Solution for Replacement Market. zoning and less installation labor. No zoning panel to install and wire. No DAT sensor to install and wire. No transformer to install and wire. Reduces wiring by about 50%. Eliminates bypass damper and ductwork. The Nighttime Airflow Option uses the upstairs temperature sensor to control heating and cooling calls and directs more airflow upstairs while sleeping. The Comfort365 has no effect on the HVAC equipment. The equipment operates at its rated airflow and return temperature. Top builders are specifying and installing the low-cost, easy-to-install wired version. 2-wire connection between upstairs temperature sensor and thermostat. 3-wire connection between dampers and thermostat. Uses the existing thermostat to equipment wiring. Upstairs temperature sensor requires no wiring. Dampers require no wiring to the thermostat and are powered by the equipment 24VAC (R and C). Wiring Hub is installed at the equipment and uses the existing equipment to thermostat wiring. Fresh Air Control per ASHRAE 62.2. Thermostat uses existing thermostat to equipment wiring. Plug and play connectors between all dampers and wiring hub. 2-wire connection between upstairs temperature sensor and wiring hub. Eliminate wiring upstairs temperature sensor by using optional wireless radio and wireless upstairs temperature sensor.